NASA Earth Observatory images by Joshua Stevens and Jesse Allen, using Suomi NPP OMPS data provided courtesy of Colin Seftor (SSAI) and VIIRS data from the Suomi National Polar-orbiting Partnership. Story by Adam Voiland. 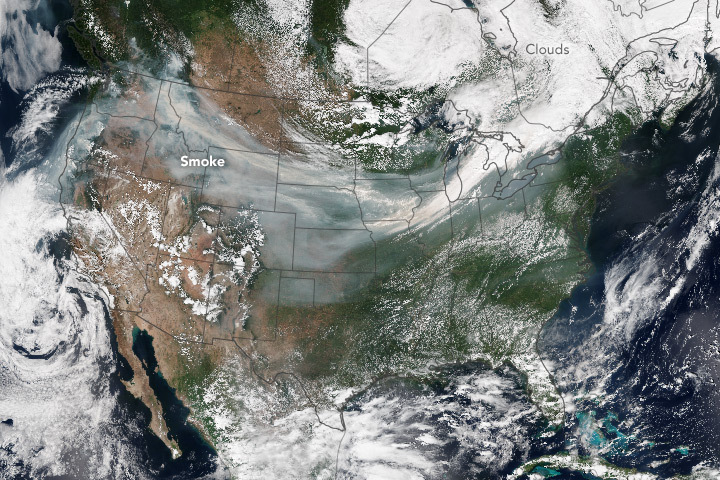 With dozens of wildfires burning across the western United States and Canada, many North Americans have had the acrid taste of smoke in their mouths during the past few weeks. On September 5, 2017, the National Interagency Fire Center (NIFC) reported more than 80 large fires burning in nine western U.S. states. People living in large stretches of northern California, Oregon, Washington, Montana, and Idaho have been breathing what the U.S. government’s Air Now website rated as “hazardous” air. The natural-color mosaic above was made from several scenes acquired on September 4, 2017, by the Visible Infrared Imaging Radiometer Suite (VIIRS) on the Suomi National Polar-orbiting Partnership (Suomi-NPP) satellite. The Ozone Mapper Profiler Suite (OMPS) on Suomi NPP also collected data on airborne aerosols as they were swept by winds from west to east across the continental United States (second image). 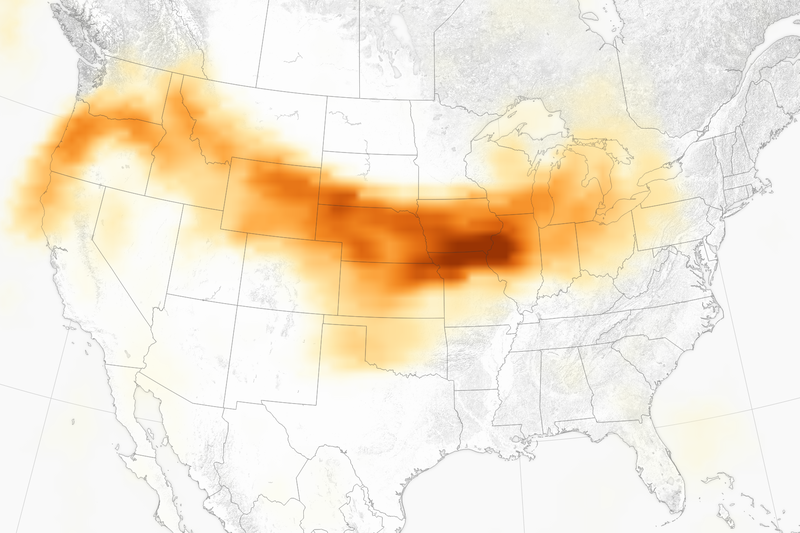 The OMPS map depicts relative aerosol concentrations, with lower concentrations appearing in yellow and higher concentrations appearing in dark orange-brown. 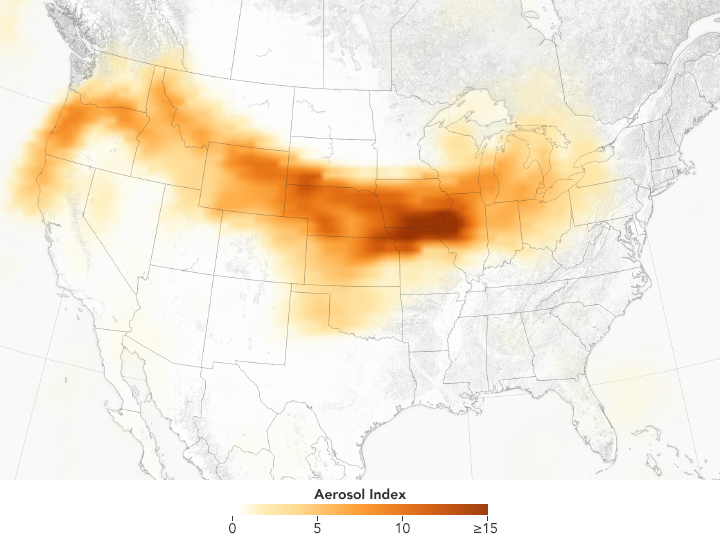 Note that the sensor detects aerosols in high-altitude plumes more readily than lower plumes, so this map does not reflect air quality conditions at “nose height.” Rather it shows where large plumes of smoke were lofted several kilometers up into the atmosphere. On September 5, roughly 7.8 million acres had burned in the United States since the beginning of 2017, according to NIFC. “While it is unlikely that this season will be record-breaking for modern fire record keeping in the western United States, it is above normal relative to the last decade—which has seen abundant fire activity,” said John Abatzoglou, a fire researcher at the University of Idaho. Unusually warm and dry conditions across a broad swath of the West has fueled the active fire season, noted Abatzoglou. A wet winter in some parts of the West also contributed by triggering the growth of more grass in the spring—grass that turns into fuel for fires in the summer. AirNow (2017, September 4) September 4, 2017. Accessed September 5, 2017. NASA OMPS blog (2017, September 5) Fire (and Smoke) Situation Worsens Over US. Accessed September 5, 2017. National Interagency Fire Center (2017, September 5) National Fire News. Accessed September 5, 2017.